Montgomery County engineers are nearing final plans to strengthen safety for hikers and bikers on the county's most popular trail, the Capital Crescent. See photos of the proposed options. BETHESDA, Md. — Montgomery County engineers are nearing final plans to strengthen safety for hikers and bikers on the county’s most popular trail, the Capital Crescent. Other bicycle safety measures are also planned for downtown Bethesda. 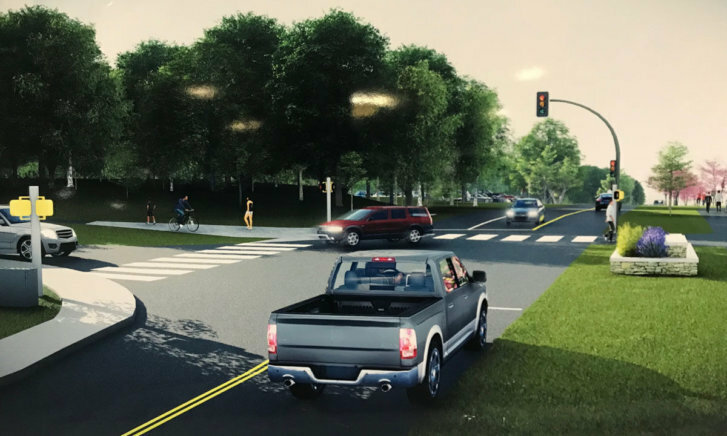 Residents got a glimpse at a community meeting Tuesday night of the final three options for safety changes on the trail at Little Falls Parkway, where a cyclist was struck by a car and killed two years ago. “We think all three do a great deal to minimize any potential conflicts between trail users and cars,” said Andrew Tsai, project engineer with Montgomery County Parks. The final three designs include permanently closing one lane in each direction at the trail crossing. Trail users would cross the parkway on an elevated, flat speed bump called a speed table. A second option is reorienting the trail and installing a traffic signal that would control both vehicles and trail users, and the third option is building a pedestrian bridge. Ned Gaylin, a retired University of Maryland professor, was struck and killed while riding his recumbent bicycle on the crossing on Oct. 16, 2016. Engineers will make their final recommendation to the Montgomery County Planning Board this winter. The county is also planning on adding protected bike lanes on roadways in downtown Bethesda, including Bethesda and Woodmont avenues. Peter Gray, a Montgomery County resident and board member of the Washington Area Bicyclists Association, is looking forward to the proposed changes. “It’s going to make it a lot safer for cyclists of all abilities, not just the people in spandex like me,” he said.